Operate at peak performance with service from Cassling. We are thrilled to assume primary responsibility of our customers’ ultrasound equipment service throughout Nebraska, Iowa, Kansas, South Dakota and select counties in Illinois and Missouri. Our approach to service—more direct and local coverage—means improved response time and less downtime. Get maintenance in accordance with Original Equipment Manufacturer (OEM) specifications—ensuring patient safety and compliance with requirements mandated by CMS and The Joint Commission. We are ISO 9001 certified and follow the highest production, installation and service standards. Gain access to all Siemens performance and refinement modifications. This includes Siemens Evolve, which extends the life of diagnostic imaging equipment for years and ensures you have imaging system capabilities that are best matched to your level of reimbursement and patient volume. Select flexible service coverage plans—tailored to your organizational needs and the capabilities of your internal staff. There’s no one-size-fits-all service plan when you work with Cassling. We’ll help you design coverage that helps you meet your organization’s short- and long-term goals. A strategic service contract isn’t just about extending the life of your equipment, it’s about peace of mind. Watch this video to learn more about Cassling’s approach to service and how it helps customers manage clinical outcomes, operational efficiency and financial performance. In today’s always-on world, your patient satisfaction scores and payer reimbursement depend on whether your equipment is up and running versus out of service. Cassling service customers enjoy an incredible 99.9 percent uptime. That’s because Cassling Field Service Engineers are truly Siemens equipment experts. They can diagnose problems faster, fix equipment more quickly and ensure your diagnostic imaging equipment is in optimal condition. Cassling service agreement customers experience 99.9% average uptime. See the real value of Cassling OEM service vs. third-party offerings with our Comparison Worksheet. Find out how much of your revenue is at risk with Siemens' Downtime Calculator. Read this Evaluation Guide to use with current and potential service providers. 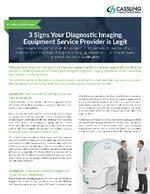 Protect your imaging equipment investment and ensure uptime with Siemens' Guardian for CT and MRI. Industry-leading response time. Cassling’s 50-minute average response time for customers with full service or warranty agreements beats the industry standard by 75 percent and ensures your imaging equipment is up and running when you and your patients expect it to be. Remote diagnosis and repair. Siemens Remote Service allows Cassling to see your system. Many issues can be resolved or repaired immediately, or a Field Service Engineer can be dispatched to handle the issue on site. Immediate access to Siemens-certified parts. Thanks to our 24/7 call center, you can get the proper parts and get them quickly. “Price” isn’t just what you pay for when purchasing a used or after-market part. Before you head down the parts purchasing path, consider these points that go beyond the obvious “new” or “used” label. 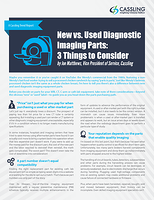 The next time you’re in the market for imaging service, avoid painful blind spots that can lead to long-term financial headaches by looking for these three qualities in your prospective provider. Why would a hospital rely on the same medical equipment service provider for more than 30 years? According to one hospital, the answer is simple: communication and respect. Cassling saves us time and money because they always get us up and running as quickly as possible. The majority of the time, we are running again on the same day. To have service available to fix anything means we don’t have to tell the ED we can’t do exams for them. Cassling demonstrates the value of their service every day by being available. That’s a huge value to me and to our patients. We look for equipment that is stable and will last, and service support close to Hays. Cassling listens and meets our needs. This is especially important with a shared service contract. Contact us today about Cassling service. We can help you weigh your service options or calculate your costs. Our service team can also consult with you on training programs for your staff, ensuring you have the right mix of internal and external service to keep your equipment running optimally. For immediate equipment repair or service needs, please call 800-228-5462.